Suspected of killing his girlfriend, a young man awakens to find a pair of horns growing from his head. Alexandre Aja's latest horror outing is an adaptation of a novel by author Joe Hill, son of Stephen King. 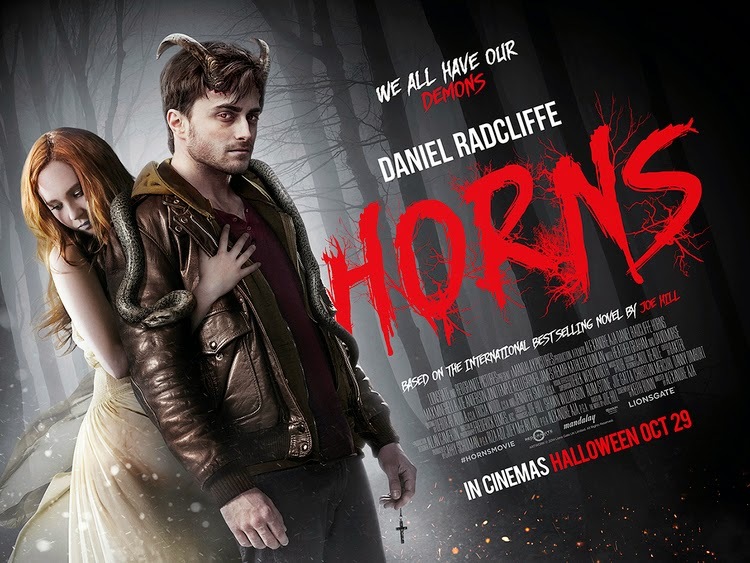 It seems the apple hasn't fallen far from the tree as Horns feels decidedly similar to many of King's screen reworkings. Unfortunately, Aja's film is more reminiscent of the raft of TV or direct to video King adaptations of the 90s and 00s than the prime era King cinema of the late 70s and early 80s, more Dreamcatcher than Dead Zone. Continuing his attempts to distance himself from Harry Potter by embracing the horror genre, Daniel Radcliffe stars as Ig, a smalltown radio DJ who finds himself the number one suspect in the murder of his longtime girlfriend, Merrin (Temple). After desecrating a religious tribute at the site of Merrin's killing, Ig awakes the next morning to find a set of horns protruding from his temples. As the day progresses, the horns grow larger and Ig discovers he has a new ability to make anyone he comes into contact with reveal their deepest and darkest secrets. Ig uses this new gift to interrogate the townsfolk for clues as to who the real murderer is, resulting in a movie that plays out like a twisted version of the Jim Carrey comedy Liar Liar. The black comedy here, however, plays in highly awkward fashion, with much of the dialogue coming across as sophomoric in its attempt to shock. Horns tackles some very dark material, but does so in moronic fashion, leaving a bad taste in the mouth with its shallow treatment of sexual abuse and homicide. Aja is something of a darling of the horror world, but save for the hilariously entertaining Piranha, he's never delivered on the promise hinted at by his French debut, Haute Tension, and Horns has the look of a film directed by someone destined for TV mediocrity. It's devoid of tension, suspense or chills, and the use of songs associated with iconic moments in previous movies doesn't do him any favours. Radcliffe does his best with a weak script, but at this point it feels like he's trying too hard. Does anyone really still only associate him with JK Rowling's creation?